I still had some smoked cheddar on hand after last week’s efforts, and what better to do with some leftover cheese than to place it between bread and grill it? A word, then, on some of the hows and whys of grilled cheese. Firstly, it’s going to be unbelievably rich. You’re filling it with cheese and frying it in butter (you are using butter, aren’t you? ), that’s fat on top of fat. You need to cut that richness with something, preferably something spicy or sharp. Plenty of places think the answer to the cheese is meat, often something quite fatty, but that’s a mistake, it’s just more richness on top of same. (This is why short rib grilled cheese is usually disappointing, and kimchi grilled cheese is never less than wonderful.) In the above case, I went with a tin of anchovies. Salty little devils, there was no question they could stand up to the cheese. I happened to have some scallions that were on their way out, and in they went as well. They brought a brighter sharpness to things, although something along the line of red onion might have been better, just because it’s more assertive. Lastly, a note on technique: Keep the heat gentle, somewhere just a touch over medium. It doesn’t take much to melt the cheese and crisp the bread, so don’t use much. 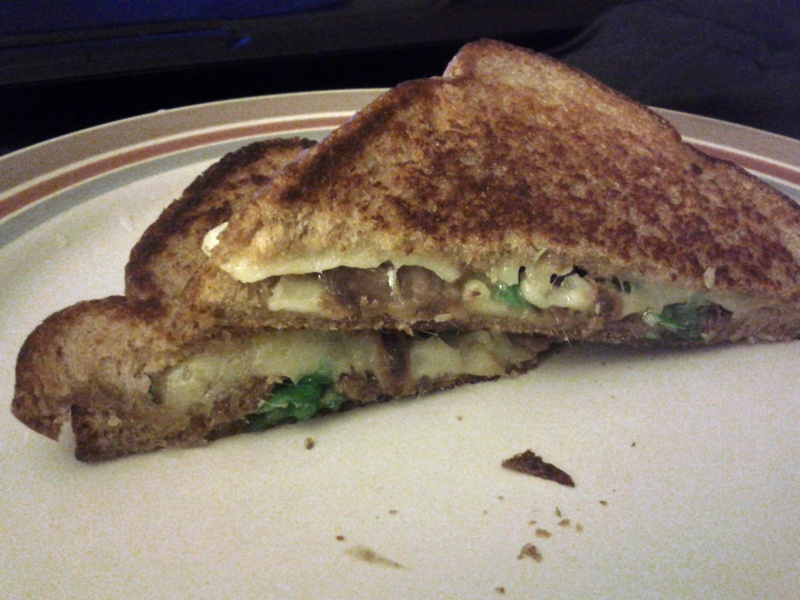 This entry was posted in Sandwich Reviews and tagged Cheese, Reviews by Pete, Sandwiches I Have Made by Pete. Bookmark the permalink. What’s your method for toasting the bread? Do you spread butter on the face of each slice, or do you melt the butter in the pan before dropping in the sandwich? I used to use the face method, but have been getting better results on the pre-melt method lately. I brush melted butter on the bread, usually a tablespoon per sandwich does it. In addition to that I tend to swipe the pan with the stick of butter, just enough to cover where the sandwich is going down.